Ulthera treatment gives a lifting effect and increase skin firmness, spectacularly improving the appearance of the neck and facial contour, especially in sensitive areas, which significantly influence the shape of the face. Because of that we can lift drooping skin on the cheeks, emphasize the jaw line, remove double chin, nasolabial folds and so-called. smoker's lines. The results of the treatment for the eye area are, among others, clearly raised eyebrows and upper eyelid. Thanks to this, your eyes become more open and regains refreshed, youthful appearance. Ulthera is an innovative type of treatments in aesthetic medicine, allowing interference into the skin, which combines ultrasound imaging with focused ultrasound energy in order to achieve predictable facelift. During the treatment, ultrasonic energy is concentrated in certain areas and delivered deep into the surface layers of the skin in a non-invasive way, which leads to a sensational results. Treatments for the face and neck trigger the natural response of the organism, resulting in the production of new and improved collagen, which gradually tightens and lifts the skin. It is the only device, which thanks to the USG display provides an insight into the tissue. 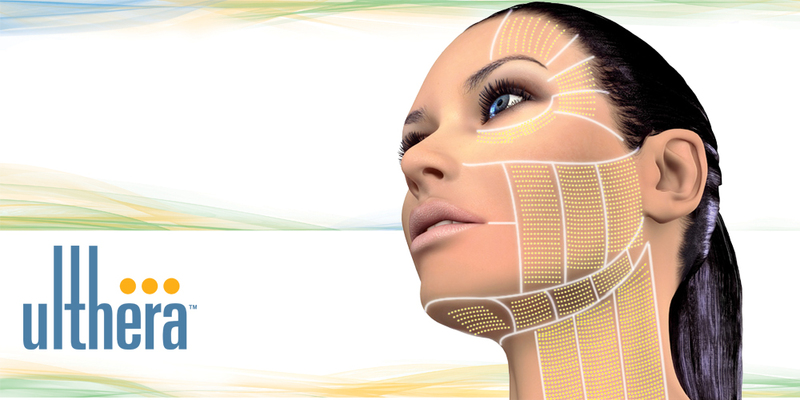 With DeepSEET technology, doctors of aesthetic medicine can see the subcutaneous tissue at a depth of 3 to 8 mm. This allows you to accurately assess and determine the correct depth at which the procedure will be carried out without affecting the continuity of the skin. The doctor has at his disposal a variety of heads, allowing to provide a stream of concentrated energy using different frequencies and different depths of action depending on the specifics of a particular area. This allows you to achieve maximum precision, and hence, the effectiveness of the treatment. Ulthera - when to use? drooping corners of the mouth. About 20% of the targeted effect appears immediately after the procedure, and the final effect is visible after about three months after the procedure. The persistence of the effect of the treatment is based on individual characteristics and properties of the skin of the patient, and lasts up to 3 years. Usually one treatment is sufficient to achieve a satisfactory effect - it can be a treatment with one or two levels deep, depending on the skin condition and therapeutic purposes. By controlling the depth of action we can cause shrinkage on superficial and deep level, which guarantees full and lasting lifting effect of the skin and underlying tissues below. Patients who wish to deepen this effect may undergo re-treatment, but not earlier than after 3 months. Your skin after the surgery does not require convalescence. You can immediately return to daily activities. The skin may experience only mild erythema, lasting no longer than two hours. Some patients may also experience slight swelling, which should not take longer than two days. The final price of the treatment is determined individually by the physician during the consultation, depending on the problem and the number of pulses used.